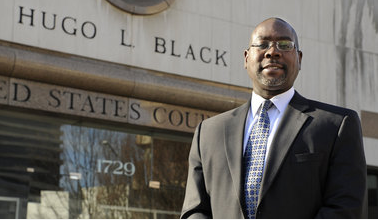 BIRMINGHAM, Alabama — North Alabama’s first federal public defender says he hopes to have offices in Birmingham and Huntsville open by summer with a staff to defend federal criminal defendants who can’t afford to hire their own lawyers. Since beginning his job in October as the Federal Public Defender for the Northern District of Alabama, Kevin Butler has been busy interviewing potential staff and locating office space in the two cities. He’s also begun fighting on behalf of a few indigent criminal defendants. “I think best-case scenario is that our office could be open in late spring or early summer,” Butler said, depending on how long it takes to secure adequate space. People charged with federal crimes in the Northern District of Alabama who can’t afford a lawyer are now appointed one from a group of attorneys on the Criminal Justice Act Panel. The district has been one of only four federal court districts, out of 94 nationwide, that didn’t have some form of public defender office to represent indigent criminal defendants. Butler said he hopes the General Services Administration — the agency in charge of leasing or building office space for federal agencies — will provide him with the options on potential locations for the Birmingham and Huntsville offices within the next two months. The offices are to be within four blocks of federal courthouses and can’t be in a building that houses law enforcement or judges, Butler said. The start-up budget for the office is $1.8 million, which does not include attorney salaries, said Karen Redmond, spokeswoman for the Administrative Office of the U.S. Courts. After the locations are leased, it may take a month or two to get the offices ready to occupy, Butler said. Butler will work in the Birmingham office along with four assistant public defender attorneys, an investigator, two legal secretaries, an office administrator and a computer systems administrator, he said. The Huntsville office will be staffed by an investigator, a legal secretary and two assistant public defender attorneys, including one specializing in legal research and legal writing for both offices. “Individuals who are extremely high-quality lawyers have expressed interest in working for the offices,” Butler said. Butler is an experienced public defender. A graduate of Cornell University who earned his law degree from Arizona State University in 1991, Butler has been in the public defender’s office in the federal court’s Alabama middle district, based in Montgomery, since 1998 — the last eight years as chief deputy federal defender in that office. Butler also served as assistant federal defender more than six years in the eastern district of California and district of Nevada before coming to Alabama. While he’s working in a temporary office with no staff, Butler has begun work on behalf of indigent defendants. In the past month, he has filed motions in U.S. District Court for Northern Alabama on behalf of federal prisoners sentenced on crack cocaine charges. Sentencing guidelines have been changed, and prisoners now may be eligible to have their sentences reduced. He said he wants the public defender’s office to be an “institutional voice” on such issues on behalf of criminal defense lawyers and federal criminal defendants in north Alabama. Another of Butler’s goals is developing community outreach programs. For example, Butler said, when he was with the public defender’s office in Montgomery he would go each month to the Kilby Correctional Facility to talk about firearms laws with prisoners who were about to be released. “A large chunk of our cases are related to illegally possessing firearms,” he said. A convicted felon who simply lives in a house with his parents could face a federal charge if his parents keep a firearm in their bedroom. “What a lot of individuals in the community don’t know is how easily an individual can be pulled into a firearms case,” Butler said. Butler estimates that the federal judges in the northern district of Alabama — a 31-county area — will assign 75 percent to 85 percent of the indigent criminal defendants to the public defender’s office. U.S. Attorney Joyce White Vance, whose prosecutors will be the public defenders’ main adversaries, is looking forward to the office opening.